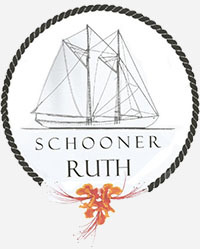 Schooner Ruth – The Racing Schooner. 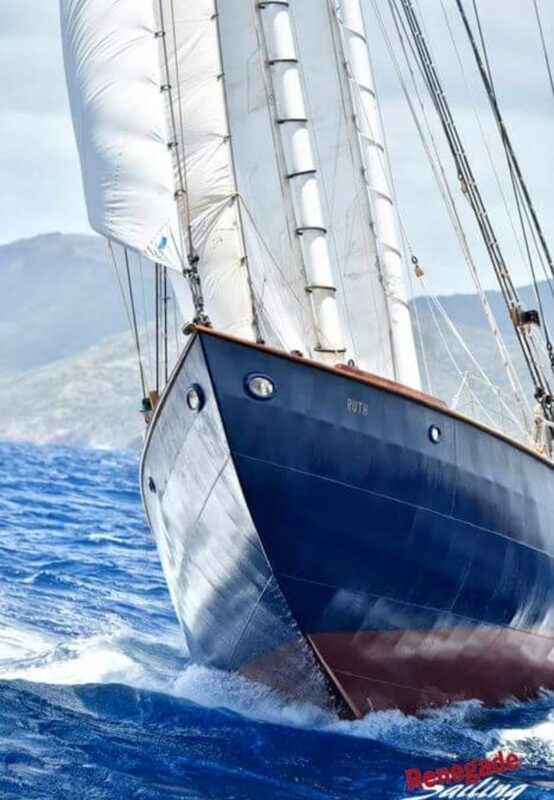 The idea of racing RUTH at the pre-eminent yacht regatta in the Caribbean for classic traditional sailing vessels percolated in my mind while I was visiting London last March and enduring the cold weather before RUTH’s owner Ian Dash invited me to become her Captain. That dream which became reality last week in perfect Antigua sailing conditions exceeded all my ambitions. 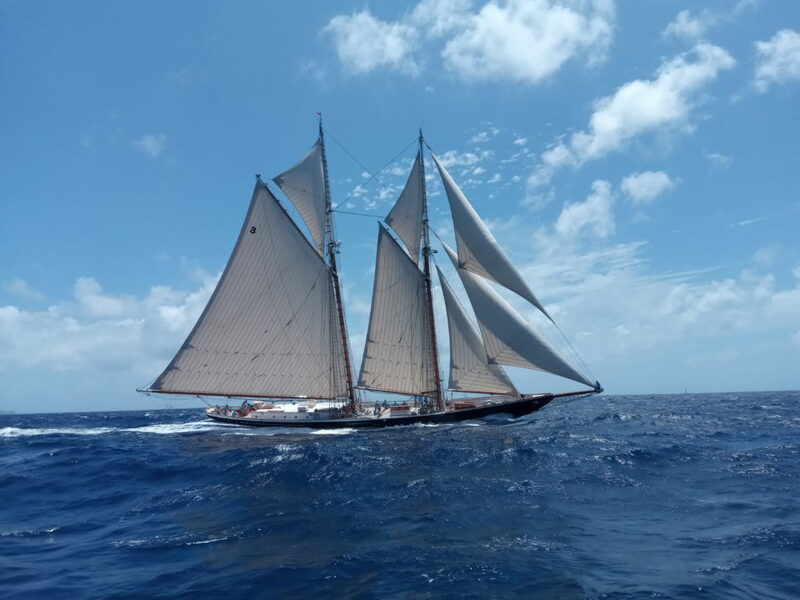 First, the stellar Classic Class A racing company we were in, the Regatta founder’s yacht ASHANTI- IV, the grand banks racing schooner COLUMBIA and OCEAN STAR which is a sail training vessel not unlike RUTH. Second, the brilliant crew I had onboard including our two remaining trainees Nazz Alexander of St Lucia and Barbadian Luke Rollitt bending on the sails and hardening the sheets and a super experienced tactician in Darryl Braithwaite (past Commodore of Grenada Yacht Club) keeping us fighting sailing fit. The first two race days were RUTH’s ideal conditions, solid East F5 with F6 gusts up to 32 knots. We had just sailed into Antigua the day before race #1 a 39 hour unbroken reach from Grenada to Antigua after hauling out for fresh paint and bottom antifouling and with single reef still in the main. No excuses, but the guys were a bit worst for wear on arrival, a thrilling sail with one night watch of three hours not seeing less than 10 knots on the dial and hell bent to arrive at Antigua in time for registration – alas we were beat and beaten that day, last to the start line. It was not without drama however. Because of a race committee radio issue we did not hear a delayed start time (we made the original start perfectly ontime -within seconds).We recovered, dutifully turned around and executed another perfect start on the updated clock, not bad for first-timers. Essentially, we luffed up behind the cliff by the western mark, then we went for it with 4 minutes to the gun, bearing away picking up speed and gave the mark a close kiss … twice! Race #2 saw another perfectly timed start but Ocean Star was nowhere to be seen (later we heard one of her crew had a bad leg injury coming down the gangway). So, our measure was to keep Columbia in our sights. On this occasion, watching Columbia tack around inside Falmouth Bay, I decided to play for all the marbles and push RUTH up pinching slowly on starboard tack along the start line – this forced Columbia to tack off their port right before the start. Of course, they passed us on port 10 minutes later, but the Captain tipped his hat in acknowledgement of some smart sailing … I’m told! 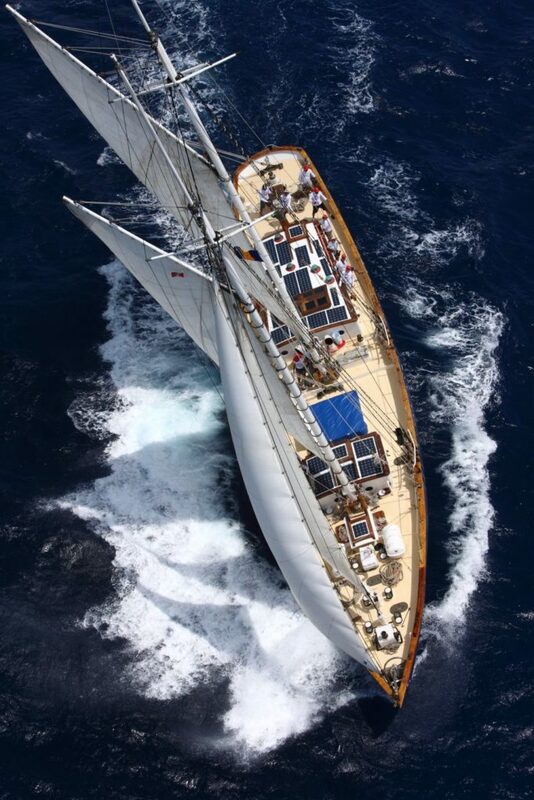 If you Google Schooner COLUMBIA, you will see the epitome of a racing class schooner, new build on a classic design. Race #3 was sailing fury, a straight course 6 nautical mile pursuit gybing on the outer mark and tacking by the start line. RUTH’s reef was out and we were flying over 9knots reaching both ways. Our signature was to approach the mark within 5 metres, bearing away before gybing and hardening up before tacking, it worked well and the crew acquitted themselves brilliantly on the sheets. On real and adjusted time we had beaten Ocean Star on the day. Race #4 was squally and in reality well above the weather forecast. The course was the toughest as well with a beat across the entire south coast. To say we had a perfect start is a huge understatement, we were on the line sailing hard (no luffing) with Columbia and Ashanti on port and Ocean Star on Starboard … the final result in pictures. This was our finest sailing day, we watched Columbia chase Ashanti in short tacks up the coast, but we found a particular rhythm heading out for a long tack since the waves were not as bad as previous days and we were constantly pulling away from Ocean Star. With higher winds than expected, the main was eased a lot to reduce our heel but the Foresail and 3 Jibs kept us pointing well. Watching the squalls rolling in we made some mean decisions looking at the clouds that the winds were going to be south of east in them and got on a starboard tack to take full advantage to head up higher, they peaked with a 32knot gust and some horizontally falling rain. So, with two squalls and two tacks behind us we made it to the Eastern mark just under the cliffs before gybing for the short downwind leg. Then it was a reach out and back into the finish in the mouth of Falmouth Harbour. We had put away all our sails when Ocean Star was crossing the line 35 minutes after us. It was the finest racing day for RUTH, and now a lot to live up to in the future. A Barbados built and launched Schooner winning 3rd place silverware in the Antigua Classic Regatta with ASHANTI IV 1st and COLUMBIA 2nd. Just before prize giving, Nazz received an honourable mention as the Sailor of the year which also settled any question of our authenticity as a deserving representative of Caribbean shipbuilding and seamanship training.